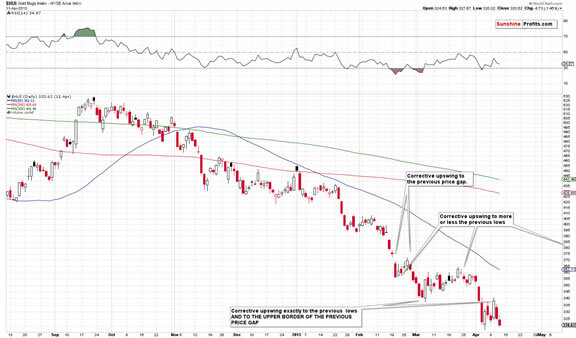 We have some good news and some bad news for both: precious metals bulls and bears. 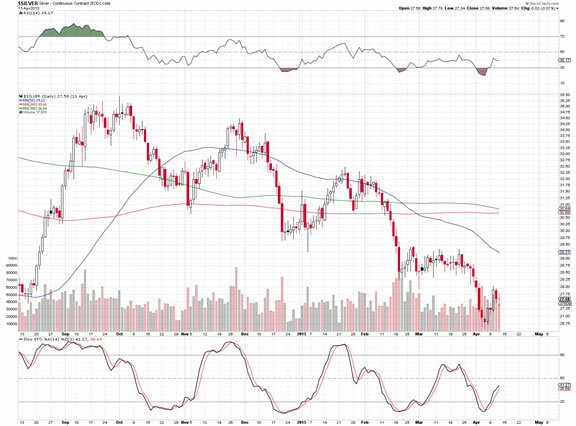 Based on new developments it’s even more likely that we are just before the huge price decline in gold, silver, and mining stocks, but at the same time it also appears likely that the final bottom will take place later than we had expected, based on the previously available information. Let’s start with additional bearish confirmations (charts courtesy of http://stockcharts.com). In our Monday’s analysis, we compared the price performance of gold that we saw in the recent months to what happened in 2013, right before the big $200+ plunge that took place in only 2 trading days. In today’s analysis, we will extend this analogy also to other markets. But first, let’s recall the Monday’s analysis. Some will say that what we’re seeing is just a prolonged bottoming pattern and what we have now is the first post-bottom pause. But we disagree. Based on multiple other factors, including severe underperformance of gold stocks, the outlook remains strongly bearish and gold price appears ready to decline once again. We emphasized that the shocking similarity can be seen not just in the position of indicators, proximity to the support and resistance lines, situation regarding the consolidation pattern, and the 50- a day moving average. 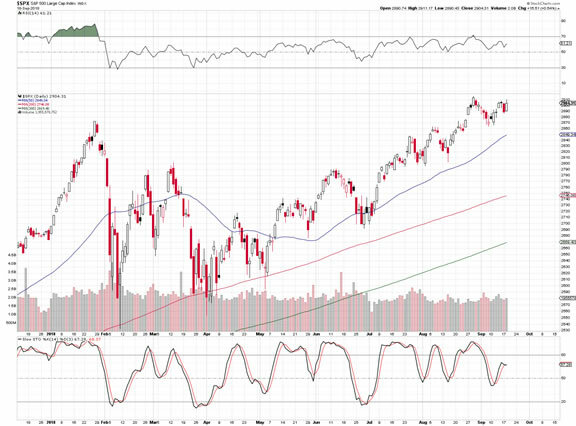 Even the 200-, and 300- a day moving averages (marked with red and green) are slowly declining and are just below the local top after which the decline accelerated. However, in today’s globalized economy, no market can move truly on its own – they are all connected in one way or another. Consequently, in order to check what’s in store for gold, it’s important to keep track of other markets also. What happened in these “other” markets in 2013 and how does it relate to the current picture? 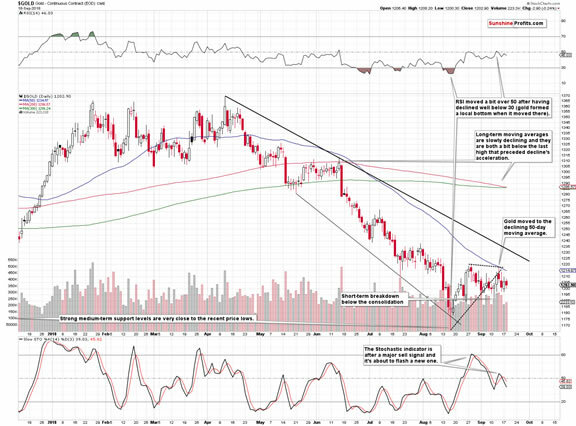 In the following paragraphs we’ll examine gold stocks, silver, the USD Index, and the general stock market. At the first sight, the overall shape of the price moves is similar, and there are several details that make it very similar. The most interesting thing is the 2.5 factor. If you divide the start and the end of the 2013 decline by 2.5, you’ll get a very good approximation of 2018 prices. The 2012-2013 decline started at about 530. 530 / 2.5 = 212. The 2018 decline started a bit below 210. The 2012-2013 decline accelerated after the top that formed at about 455. 455 / 2.5 = 182. The 2018 decline accelerated after the July top that was at about 182. Shocked yet? There’s more. The pre-slide bottom in the HUI Index in 2013 was formed at about 320. 320 / 2.5 = 128. The intraday September 2018 bottom was 131.12 - extremely close to the above. What happened next in 2013? 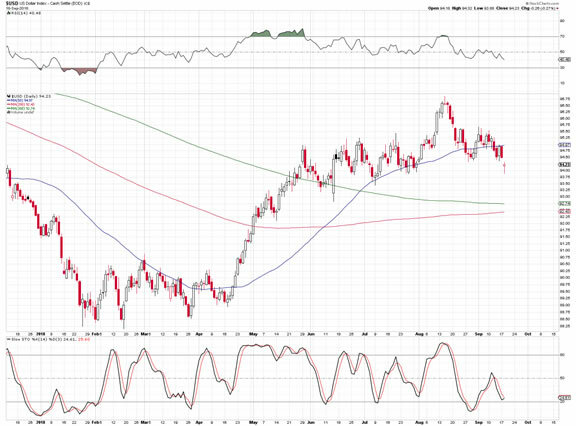 The HUI Index rallied up to the previously broken support level and verified it as resistance. The support / resistance was provided by two levels: the previous local bottom, and the upper border of the most recent price gap. The HUI Index currently moved above the former, but not above the latter, so we might say that it’s in tune with the past pattern. The HUI Index rallied precisely from 317.42 to 340.69, which means that it moved higher by 7.33%. Applying the same to the most recent bottom gives us 131.12 * 1.0733 = 140.73 as the analogous upside target. That’s more or less where the HUI Index closed yesterday. To be precise, the intraday high was 142.27, but that’s very little deviation from the target. Please note that the previous downside target based on the analogy and the 2.5 number was 131.12 instead of 128, so it was off by about 3 index points. The current target is off by about 1.5 index points is the analogy and its remarkable accuracy seem to remain in place. The implications are profound, because the above means that the upside is extremely limited and the follow-up slide is very, very close. Before moving to silver, we would like to discuss one additional interesting phenomenon. In case of gold, in 2013, we saw a decisive decline right after the initial top, then a decline at a slower pace and then decline’s acceleration, while in 2018 the initial decline was a prolonged top that was followed by the decline’s acceleration without the slower decline in the middle. 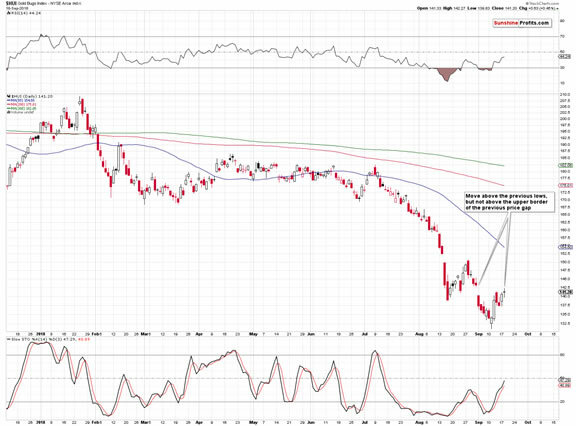 The interesting thing about the above is that it was the other way around in case of gold stocks. In 2013, the HUI Index declined at a relatively slow pace initially and then the decline accelerated. In 2018, the HUI Index initially declined decisively, then consolidated for months and then the decline accelerated. In a way, looking at performance of both parts of the PM sector in both years makes these periods more analogous than if we looked only at one of them alone. The implications are extremely bearish. In case of silver, the similarity is not as striking, but it’s still present. In both: 2013 and 2018 we had 3 local tops before the decline really started. 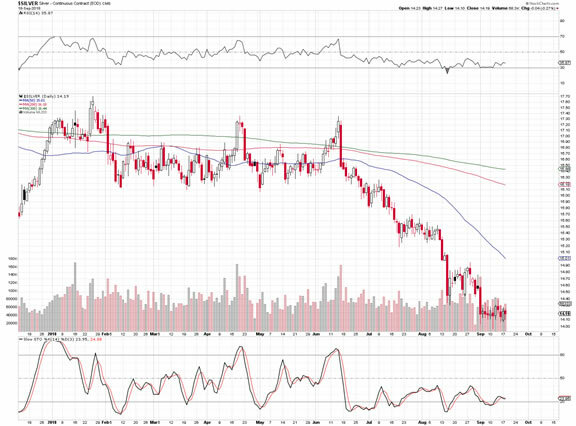 And, the final corrective upswing before the April 2013 slide took the white metal to the previously broken bottoms. That’s exactly what silver did on September the 13th, 2018. But the USD Index is declining! The precious metals will soar when USD slides! We’ll get to the details later on, but first, please note that… This seemed to be the case in 2013 as well. 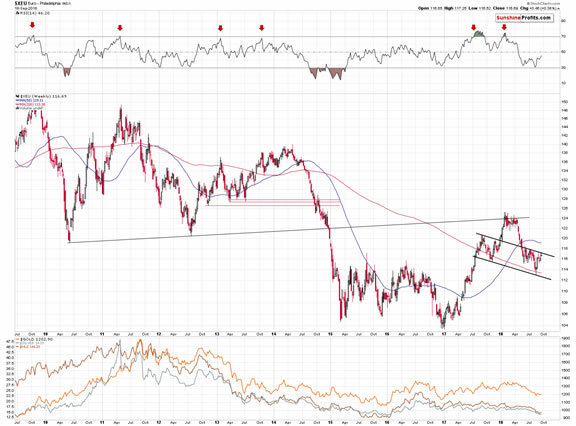 The USD Index looked like it was just about to decline after topping in 2013 as well. At least from the short-term point of view. If that was exactly what preceded the huge slide in the PMs in 2013, can it really be something that’s considered bullish today? It might have been, if it wasn’t for the similar performance that we saw in the past months. Even the decline that preceded the early bottom was somewhat similar with a pause right before the final slide. After the initial bottom was formed, the USD Index formed a head-and-shoulders pattern, which was never completed (again, in both cases). Instead, a big rally followed the right shoulder of the pattern. 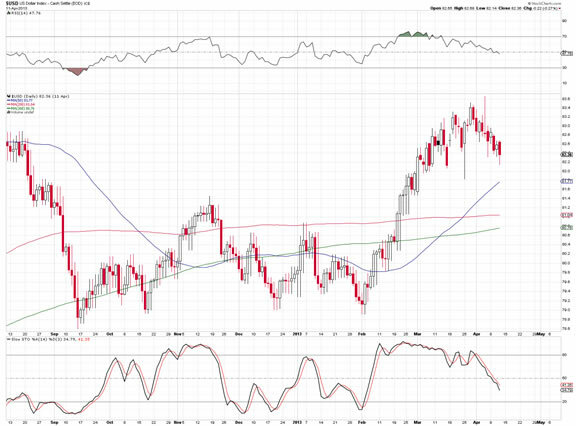 The rally took the USDX visibly higher and before the local top, the rally slowed down. Again, this happened in both: 2013 and 2018. And then, just before USD Index moved to its previous notable local bottoms (currently June and July bottoms are between 92.5 and 93.5)… Gold took a dive. The shape of the price moves is only somewhat similar at the first sight, but the details are actually in tune. After the initial rally, there was a visible decline and correction that took a few months to complete. 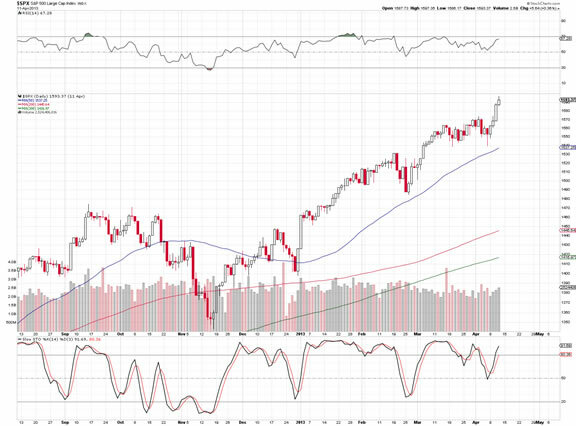 Then, the S&P 500 Index started a major rally and it’s technical position looked favorable. In 2013, the general stock market was simply soaring, and right now the rally has not been as visible, but still, the S&P is after a breakout above the previous highs and its verification, so the technical outlook does appear quite bullish. Since the situation in both: USDX and the general stock market appear similar to what we saw in 2013, right before the big dive in the prices of precious metals, the implications are bearish. Before summarizing, we would like to examine the situation in the currencies. Even though the USD Index moved lower yesterday, the outlook for it didn’t change. Ultimately, the Index cannot move regardless of its components and the outlook for the key components of the USD Index didn’t change. The line created as parallel to the line based on two important bottoms was not broken and it continues to serve as resistance. We expect to see a turnaround and sizable declines in the European currency shortly. Yesterday’s session didn’t change anything in the EUR/USD currency pair and the same goes for the situation in the Japanese yen. 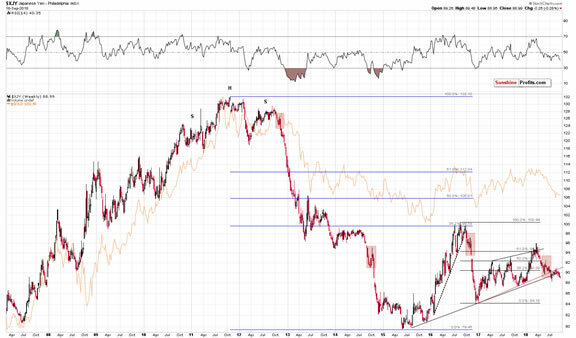 Both: the euro and gold are still likely to decline in the following weeks. The yen even closed the session a bit lower. Consequently, the implications of last week’s breakdown remain up-to-date and are bearish for the yen (and bullish for the USD/JPY currency exchange rate). As a reminder, the Japanese yen ended the previous week visibly below the rising black support line that’s based on very important bottoms from 2015 and 2016. Since the support line is based on such important bottoms, it’s also very important itself. And, since the weekly closing prices are more important than the daily closing prices, what we saw last week was profoundly bearish for the following weeks. The implications are bearish for the precious metals market due to the link between the yen and the price of gold (you can see the latter in the background of the above chart and it’s immediately clear that it moves in tune with the value of the Japanese currency). Summing up, the situation on the precious metals market remains very bearish, as it’s likely that we are right before a major plunge, similar to the one that we saw in April, 2013. This is confirmed not only by what we’re seeing in the gold market, but also by what’s happening in silver, mining stocks, USD Index and the general stock market. It seems that the big profits on our short positions will become much bigger before this trade is completely over. Still, the upcoming late-September or early-October bottom in the PMs may not be THE final bottom for this decline. 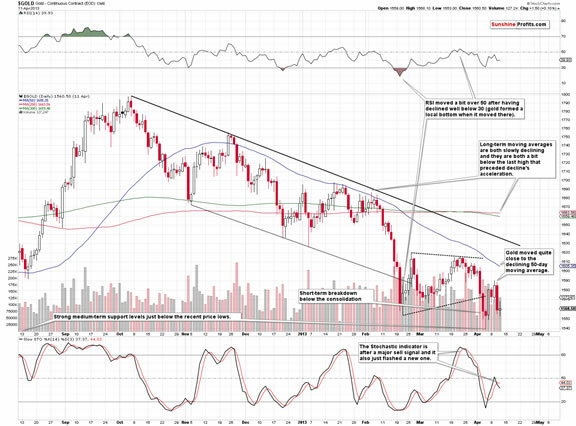 You will find more details on the above, including the likely price path in the following weeks in the full version of this analysis – in today’s Gold & Silver Trading Alert.